Description: This project point out the use of maths functions and the material functions as well as translation function. 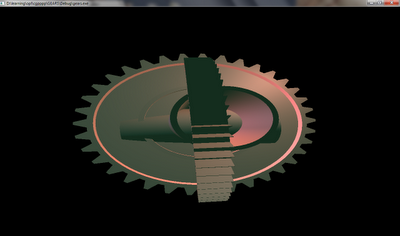 A mechanical gear model is made to move in random direction. Two of the Gears are perpendicular to each other and moving. The teeth is curved in both the gear with a very keen look to make visible like real. USAGE: No Interaction, you may add codes to change the speed of the motion as well as to stop moving the gears. The gear starts running as program start. If any change is done please tell the code in the coment box. hi can u please help me with a code where i may add user interaction in this. also while running the code the gears move very fast so would appreciate if u could guide me as to how do i reduce the speed of gear movement? hey plz send me the code of this project. not able to download it. wat'd the problem in code downloading? how you make it? can you explain a bit?????? ?